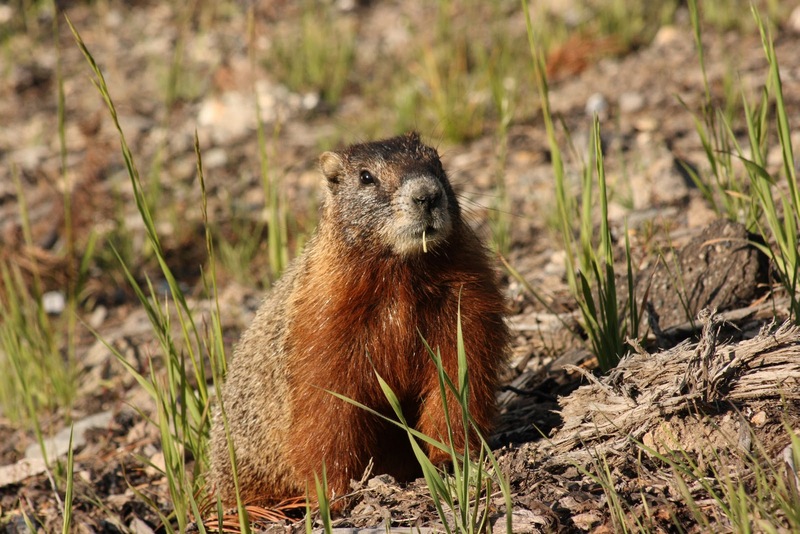 Collecting Stray Thoughts: Yellowstone, Tetons, and Dave....Oh My! Yellowstone, Tetons, and Dave....Oh My! I'm writing tonight, in part, simply because it has been so long since I last wrote. I had hoped to never go more than a month between posts this year, but over the past few weeks, I have been rather void of things I wanted to write here. There are many reasons, not the least of which is my current job which tends to leave me rather emotionally drained by the end of the work day. It's not as if I have not had anything worth sharing. Merilee and I spent four wonderful days in Yellowstone last month, where I caught this guy having breakfast. He acted like he actually enjoyed being photographed, so I was more than happy to oblige. This is just one of many photos I took of this marmot, the first I have ever seen. We saw many amazing things on this trip, including a grizzly and her two cubs, and the eruption of Grand Geyser; one of those that goes off only once every 12 hours or so. I went crazy with the camera. 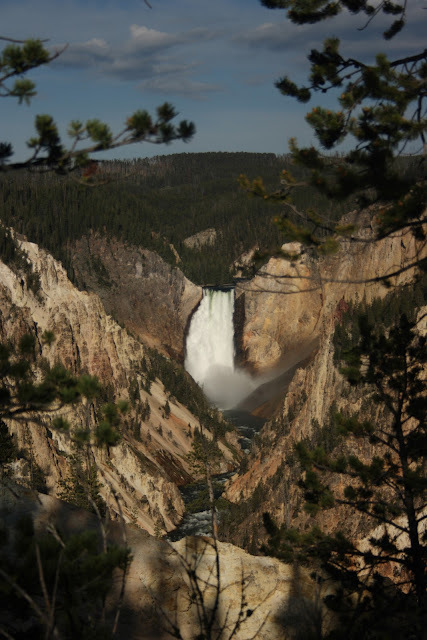 This photo is an early morning shot of the lower falls of the Yellowstone. We were leaving this amazing area just as a bus of Asian tourists arrived after having the pace almost to ourselves for almost 30 minutes. On this trip we tended to concentrate on things we had not seen before - Black Sand Basin, Artist's Paint Pots, West Thumb Geyser Basin, and the Mud Volcano area - so it was, in many ways, like visiting the park for the first time. Yes, we did see Old Faithful a couple of times, but I did not take a single photo of it this trip. My attention was on other wonders of this unique landscape. Yellowstone is an amazing place, and we had a great time, But we decided that July is definitely the wrong month to visit due to the crowds. We also had the single worst site in the Canyon Campground; right on the corner where we had great views of the laundry/shower building and the buildings parking lot. We were also lulled to sleep at night by the dulcet tones of the building's generators. We ended up leaving a day early because we had grown tired of living in a fishbowl. Still, the time away from camp was amazing. Another great thing was driving through Grand Teton National Park both to and from Yellowstone. We took a few side trips in the Tetons that we had never taken before and were well rewarded. The views of the mountains from the east side of North Jenny Lake were spectacular, and the view from atop Signal Mountain was breathtaking to say the least. It was a great trip and we really enjoyed it. We were more that a little reluctant to return to our day-to-day existence. Next month we plan on heading down to Capitol Reef for a few days, with a side trip to Bryce. I have not been to Bryce since I bought my digital camera, so I fully expect to come back with quite a few photos. We will be traveling down highway 12 as well, and I understand that is a beautiful drive. I'm looking forward to those heirloom apples right off the tree, red rock hikes during the day, and crisp, cool nights around the campfire. October brings a trip to Arches (that I keep bringing up) to celebrate when we got engaged. These two trips will have to get us through until April when we have more trips tentatively planned. If only my work were as rewarding. Since Yellowstone, we have done some hiking on Timp and in the south fork of Provo Canyon, but one of the most exciting things we have done was see Dave Matthews Band in concert on the 17th. I have wanted to see Dave for some time now, so being at Usana and hearing them play live was a great experience. I love live music and Usana Amphitheater is one of the best venues around because it is outdoors and the music does not bounce around the interior of a building. Dave sounded amazing and I really enjoyed the show. I'm glad we got to go. Aside from those things, life has centered around work and getting a root canal and crown on one of my molars. Who knew that the process would take more than a month, but here I am awaiting my final appointment on Thursday. The dentist has been great, but once this round is completed, I don't anticipate returning any time soon. For one thing, I can't afford any trips for awhile, though I am certain there is plenty of work left to do. Thus completes my Reader's Digest version of the last few weeks of silence on the blog front. I don't anticipate having another break of this length any time soon. One reason is I have been reading Undaunted Courage by Stephen Ambrose. It is about Meriwether Lewis and the Lewis and Clark expedition, and it has inspired me to begin keeping a journal of my outdoor adventures. I purchased a small journal that I can take with me as we go camping and hiking, and I can record my experiences right there where they happen. It has also inspired me to be better at writing here, as well. We'll see how it goes. Wish me luck.